Sold by Oceemio and Fulfilled by Amazon. Gift-wrap available. 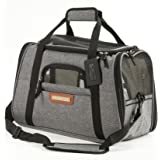 Amazon's Choice for "dog carry bags"
Airline Approved Pet Carrier – Designed for travel, this under seat carrier for cats and dogs is 17.5” x 10” x 11.9” for in-cabin airplane storage that’s safe for pets and meets all FAA requirements. 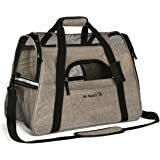 Enhanced Breathability and Comfort – Each soft pet carrier features mesh windows for added ventilation and two removable ultra-plush fleece sleeping pads to support their little joints for added travel luxury. 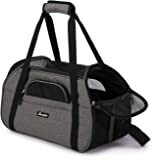 Superior Safety and Access – Our pet airline carrier for small dogs and cats features three quick-access openings for improved convenience, as well as reflective strips for night visibility, reinforced safety zippers, and seat belt buckles for car travel. 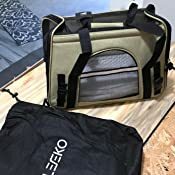 Rugged, All-Purpose Pet Use – Crafted with a tear-resistant mesh and heavy-duty polyester fabric, these collapsible cat and dog carriers support small pets up to 11 lbs. that are max 17.5” long, 11” tall, and 10” wide. 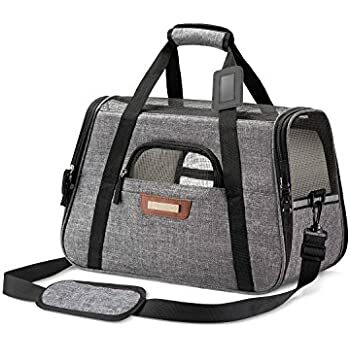 Portable Carry Travel Convenience – Each pet travel carrier is designed with dual padded carry straps on the top, a pet ID tag or luggage tag sleeve, two pockets for treats or accessories, and a clip-on, adjustable shoulder strap for travel comfort. 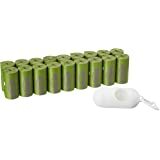 Sold by Oceemio and ships from Amazon Fulfillment. 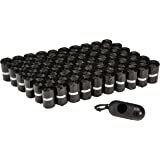 Sold by ComsunDirect and ships from Amazon Fulfillment. 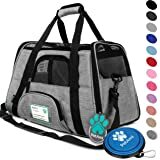 Pawfect Pets Airline Approved Pet Carrier Soft-Sided Cat Carrier and Dog Carrier for Small Dogs and Cats, Fits Underneath Airplane Seat. 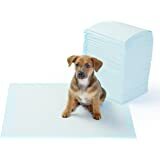 Comes with Two Fleece Pet Mats. friend in pet bliss all through the trip. 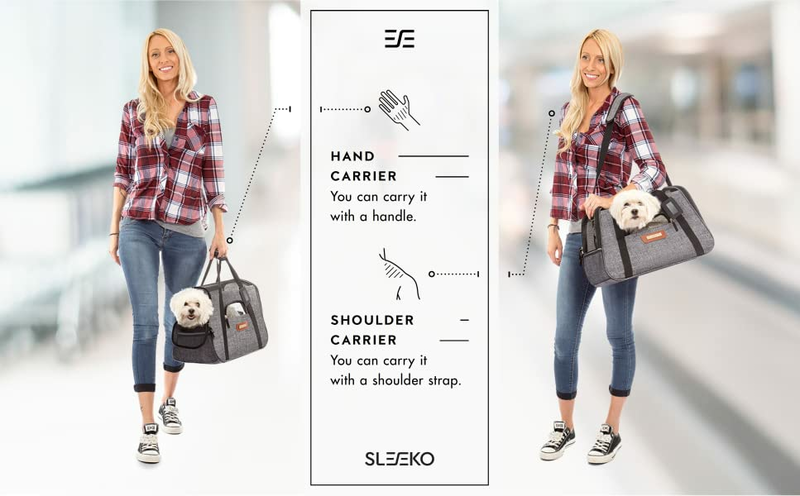 And that’s how the Sleeko pet travel bag came into being! wash the other. 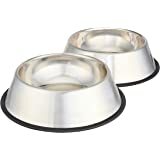 Treat your cherished pet to incredible comfort on all your travels! 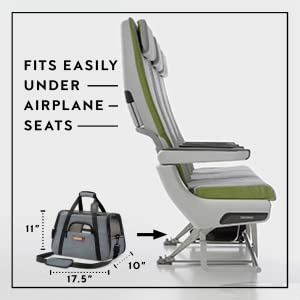 (L) X 10” (W) x 11”9 (H) Easily fits under the seats of most planes. your pet remains nice and safe all through. 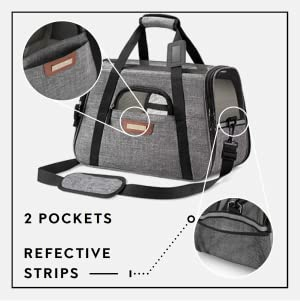 Comes with 2 pockets for easy storage of pet accessories. Reflective strips ensure safe nighttime visibility. 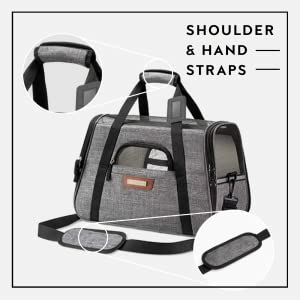 Padded hand strap and clip-on shoulder strap for comfortable portability. Ultra-tough polyester material and tear-resistant mesh for maximum durability. 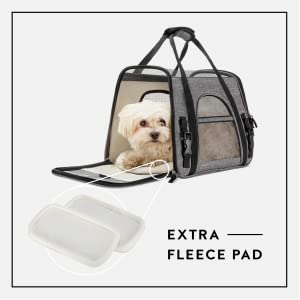 Total of 3 zippered openings for easy access to your pet. 2 seatbelt buckles for securing the carrier to your car seat. 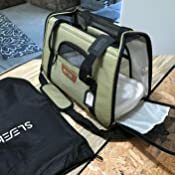 I bought this bag based on the reviews, the bag is a good bag overall, but has some design flaws. 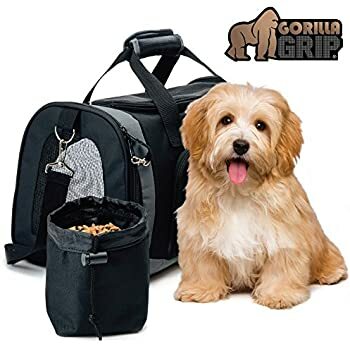 First, because the strap attachment is attached to the bag at the mid-way point, when using the bag, it has a tendency to want to flip on its side. Secondly, the removable bottom isn't rigid enough. 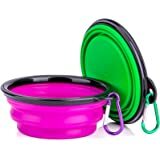 to support my 6 lb dog. The bottom starts to bend and the bag starts to collapse around her. Thirdly, the handles are sewn at the mid-way point on each side of the bag, when using the handles to lift the bag, the bag begins to "pinch" her, this would be less apparent if the handles were sewn at the top edge of the bag, and not the mid-way point. If you are just taking your dog to the vet, this bag may work for you, however, because I fly with my dog monthly, she spends on average of 4 hours in the bag. I want her to be as comfortable as possible. Her comfort is my responsibility. This is a nice looking carrier; however, it's not very practical in use. The color (grey) is complimentary; the quality is average. This is ALL a soft sided carrier....which means that it doesn't hold form very well. Several times, I dumped my cat upside down when picking up the shoulder strap. 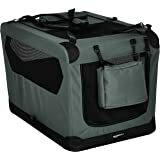 When using the handles, the top of the carrier then scrunches together, reducing the space inside for the animal. The shoulder strap pad is not attached and slides around at will. There are no closed pockets. 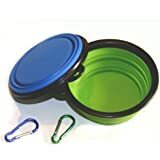 There is one pocket on the side that doesn't close; another one on one end. There are two openings....one flap folds all the way down; the other doesn't open quite as fully. There is no top opening. There are two nice sherpa floor coverings. The zippers are locking and great in quality. 5.0 out of 5 starsVentilation, right size, quality build. Flew yesterday wthi the Bag. FIst the bag is well made, having given through another bag from another manufacturer that wa not. The design allows for good ventilation. 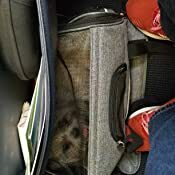 My dog (Gary a Shih Tzu) actually liked being in the bag while we were waiting in the airport. He hated takeoff however and started to scratch his way out. The bag stood up well with no damage. Eventually he calmed down and the bag still looks like new!. 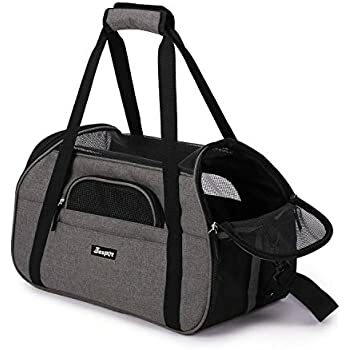 I spent quite a bit of time researching bags and this one in great, especially since it fits under the seat (on alaska airlines at least). 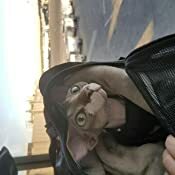 Did the job for us to carry our cat on the plain, but DEFINITELY not for larger cats. 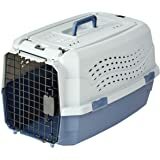 Though, we were able to keep our cat (15 lbs) in here for the better part of a day during a cross country move. Airlines require a specific size, so you're kind of stuck with how big you can get for on-plane boarding. Crammed for larger cats, but does the job. Honestly, first review I post. 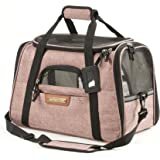 I loved this pet carrier. I just adopted my mini-dachshund in Colombia (Southamerica) and took her with me to the US. I felt very satisfied it was sturdy enough to make her feel safe, and flexible enough to fit under the seat of the plane. 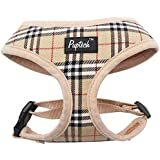 I liked it has a lot of mesh so you can check on your pet without open the carrier. That was perfect every time she woke up so she could see me or smell me and feel safe and go back to sleep. She seemed absolutely comfortable during the whole trip (12 hours total: 2 flights plus wait in two airports) Also, during the month I spent in Colombia I opened the bag and let it on the floor so she could be familiarized with it. Many times she scratched it, bit it, sat on top, and actually played with the thing without breaking it! Finally, (and I know this is the less important thing) it looks very nice, inside and outside. I liked the fabric and zippers do not look cheaply made. 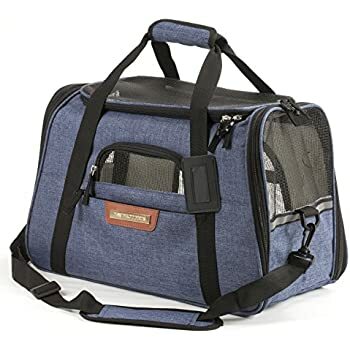 I bought this travel bag as a replacement for the one my five-pound terrier puppy was able to punch through the top of and escape a few times with no problem (that one was a different brand). She hasn't been able to escape this new one so far. I love that the zippers clip together (baby girl is smart enough to push the zippers apart to make an escape hole) and that there is no top exit. The mesh seems durable enough so far; I see claws and teeth poking out of it frequently, but she hasn't managed to chew a hole in it yet. She seems to appreciate that there is lots of mesh so she can see out and keep an eye on me. The crate is a little bit big for her right now, but I'm happy about that too because there's room to grow. 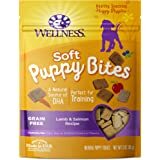 Really, the only reason I gave this four stars instead of five is that I haven't had it for long enough yet to know if the mesh really will hold up to the tiny sharp teeth and claws testing it constantly. 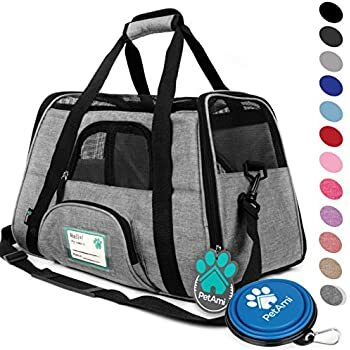 What a great pet carrier!!! Excellent quality! The little details are awesome! 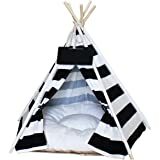 Perfect for my small dog!!! Fast shipping! The only negative (it's not really a negative) is that the color description was yellow tan. It's really just a tan. Not what I would call yellow. Still love it! BEST PET CARRIER EVER! 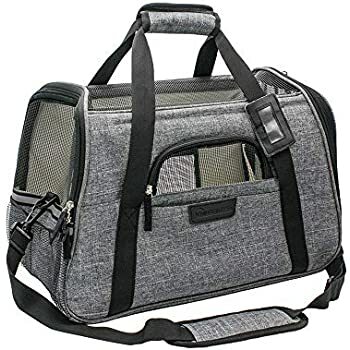 I was originally looking for a backpack pet carrier but opted for this one because the backpacks were too big and bulky for air travel. 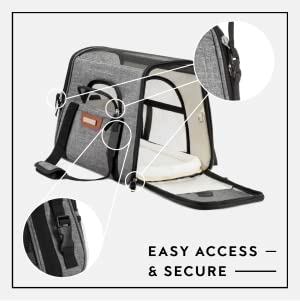 This carrier is perfect! Very well made and sturdy and it seems like they really put some thought into this. 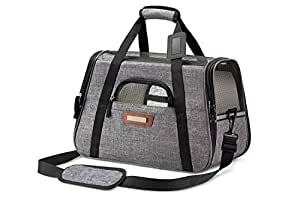 It's small enough to fit under the airline seat and plenty of space for my little guy.....plus it looks nice. My yorkie is roughly 7 lbs and there is still a lot of room .